Passengers are stranded in India and around the world after Jet Airways suspended all international flights. Flights from London, Paris and Amsterdam are among those grounded amid fears about the survival of India’s largest private airline. The airline cancelled all international flights until Monday when, according to reports, it will meet its lenders again to try to secure funding. 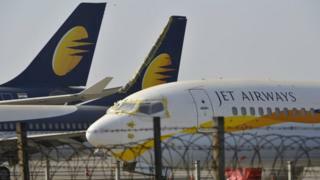 Jet Airways is saddled with more than $1bn (£765m) of debt. It is seeking a financial lifeline to avoid collapse and, on Thursday, grounded 10 planes over unpaid fees to leasing firms . These were the latest flights to be grounded and it was not clear how many of its fleet of more than 100 planes was still in operation. Local reports suggested that it was barely a dozen. The airline flies on 600 domestic and 380 international routes – but carriers in India must maintain a fleet of least 20 aircraft to continue to operate international services. From London, the airline initially confirmed it had cancelled its flights between London, Paris and Amsterdam and India for 12 April, but later said that all international flights would be cancelled between 12 and 15 April. It said it “regrets the inconvenience caused” to its passengers and was “working to minimise guest inconvenience”. “In parallel, the airline’s management and its key stakeholders including its consortium of lenders, continue to work closely towards resolving the current situation,” it said. There was no statement about the status of domestic flights. Sandeep Kooner and her three children had been expecting to be on a flight from London to India on Friday evening to attend her niece’s wedding in Punjab. But the 40 year-old who lives in Walsall will now miss the first few days of the week-long celebrations after her Jet Airways flight was cancelled. “I had just sat down in the nail salon when I got a text message to say my flight had been cancelled,” she told the BBC. She has now arranged to fly with Air India, but that will be days later and to Delhi – an eight hour drive to her destination – rather than a local one. “I’m not 100% sure my problem is 100% sorted,” she says. Television channels in India reported that the prime minister’s office had called for an urgent meeting to discuss the airline. They also reported remarks by government officials saying Jet Airways only had funds to operate six to seven aircraft over the weekend. India’s Aviation Minister, Suresh Prabhu, had tweeted that his ministry would “review issues related to Jet Airways” and “take necessary steps to minimise passenger inconvenience and ensure their safety”. The UK’s Civil Aviation Authority said it was aware flights had been suspended. The pilots union in India is planning a protest on Saturday and has written to the airline demanding that employees are paid. Staff of the airline were pictured by Priyanka Iyer of Business Television India marching to the company’s headquarters in Mumbai. In March, when the crisis at Jet Airways led to thousands of flights being cancelled, the government immediately stepped in and asked public sector banks to rescue the private carrier. It was a rare move. With India holding a national election, Prime Minister Narendra Modi’s government did not want the airline to be grounded as that would have affected 23,000 jobs. The lenders which took control of the airline have only released a fraction of the amount they had promised so the airline has not been able to pay aircraft leasing companies. This means its fleet has shrunk further from the 100-plus it had at the start of the year. The lenders have started accepting bids from potential investors, but that process will take a couple of months to complete. And many analysts fear that Jet Airways will not survive even a week if immediate cash is not provided to keep the operations running. The airline was founded by Naresh Goyal more than 25 years ago and he and his family currently own 52% of the airline, although that majority stake is expected to be lost as lenders’ restructure the debt. The group is searching for a new investor to acquire a stake of up to 75% in Jet Airways. The deadline for bids had been extended to Friday, according to reports. Ellis Taylor, deputy Asia editor of Flight Global, told the BBC the airline was in a “precarious position”. “The interim lifeline that the carrier talked about two weeks ago looks like it won’t materialise any time soon, and that really leaves its future looking bleak,” he said. There were reports in local media that India’s aviation ministry might review the regulations setting the fleet cap, which could allow the airline to resume international services.